In a large pot, combine the wine with the bay leaves and bring to a boil. Add the mussels, cover and cook over high heat, shaking the pan a few times, until the mussels open, about 5 minutes. Drain the mussels in a colander set over a medium bowl. Pour the mussel broth into a glass measure. Crumble the saffron into the hot mussel broth. Reserve. Discard any unopened mussels. 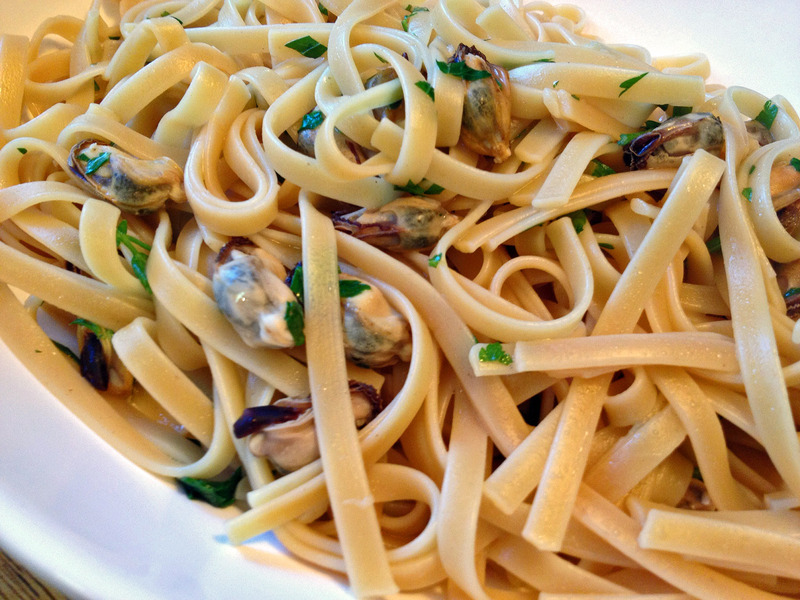 Remove the mussels from their shells and place in a separate bowl. Pour the melted butter over the mussels and toss to coat. Cover with plastic wrap. Heat the olive oil in a large skillet. Add the thinly sliced garlic and cook over low heat just it gets some color. If you prefer, remove the garlic, if not, leave it in, and add the crushed red pepper, cooking together for one minute. Slowly pour in the reserved mussel broth, stopping when you reach the grit at the bottom of the glass measure. Add the lemon juice and simmer over moderately high heat until the sauce is reduced to about 1 cup, about 8 minutes. In a large pot of boiling, salted water, cook the pasta just until al dente. Drain the pasta well. Add the buttered mussels and the hot spaghetti to the mussel sauce and toss over low heat until the pasta is uniformly coated. Season with salt and pepper. Sprinkle with parsley and serve. Comments: Glad to inform my fear of mussels is a thing of the past. I probably discarded more mussels than needed, as I rather be safe than sorry, and was a bit insecure preparing them for the first time. This is a delicious pasta! Of course, having great quality saffron adds a lot to it… 😉 Now that I am not afraid of cooking mussels, we will have them at our dinner table on a regular basis, brightening up our Wednesdays, as we slowly move towards the weekend. Jealous. I can’t get mussels. But if I had them, I’d make this lovely dish! Too bad you cannot get them, but maybe if you talk to your grocery store manager you could get him to include it in a future shipment? I know you can buy seafood online, but the shipping charges can be heart-attack inducing. Minus the saffron and pasta, and with the addition of an egg/cream liaison, this is not too far off from Pierre Franey’s famous “Billi Bi” soup. Which is also just about my favorite recipe in the world. Viva mussels! I also recently cooked mussels for the first time. They were farmed and nearly beardless but I couldn’t stop myself from scrubbing them. The recipe I tried was good but not great, especially considering the length of time I stood at the sink scrubbing! Yes, well you know me! In my defense, I did not have to let my steaming broth settle – it did not contain a speck of grit. This looks delicious. I’ve yet to cook live mussels but I hope to one day. Hope you make it and look forward to a full blog post about whatever recipe you pick… it will be delicious! This meal would make any day a celebration. We love mussels, Sally, and I’ve cooked them for many years, usually with garlic, shallots, saffron, and white wine and whatever herbs I have on hand. The best we’ve ever had were gathered on the Maine coast by us! Small, briny, and perfectly fresh makes a difference, but I don’t turn up my nose at farmed ones. I’m glad you came to them at last since they’re delicious and not hard to clean. Nice stash of saffron there – I had what seemed like a lifetime supply for years, but now I buy in smaller quantities. I don’t like to be without it. Wonderful post and a beautiful dish…. Sally: I love saffron…Your pasta looks divine! I’d love to have a good plate of it for dinner. a side note for my readers: you must visit Denise’s site, she is a Brazilian who like me emigrated to the US and blogs almost exclusively about Brazilian food. Great blog! Ah, that’s funny, another fellow blogger just devoted a similar post to mussels gone wrong. Happy you’ve overcome your fear because this is a gorgeous dish – love the main shot too Sally – such an interesting photo. Saffron you say? wow, wow, wow, nothing too fancy chez vous ;-). Have a beautiful weekend lovely! Say hello to your four-leggeds for me please :). I’ve never cooked with mussels either! I would have had no idea about the beard though…good thing that was all taken care of. 😛 Sounds like a delicious dish! Yes, the beard thing is scary. I am just about ready to try another recipe that seems awesome and quite “different”. That saffron sauce sounds wonderful. Oh Sally, you know we love our mussels. All four of us would love, love, love this dish. 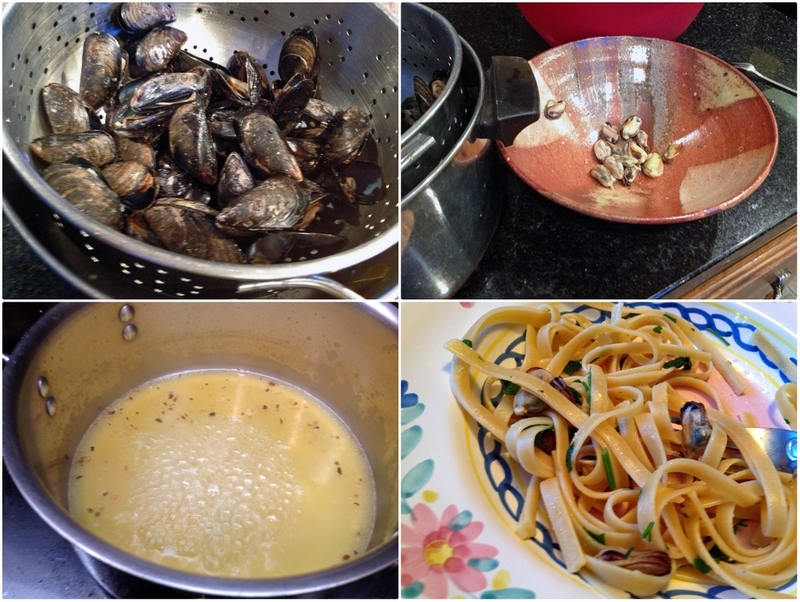 So glad you got over your fear of cooking mussels at home to share this with us. I have some saffron on hand too! 🙂 Yay!